Hyundai Motor Co. joined automakers pledging massive spending in the years ahead to address the industry's transformation and fend off new competition from the likes of Tesla Inc. The South Korean maker of Sonata sedans and Tucson crossovers plans to invest 45.3 trillion won ($40 billion) in the next five years in development of new models and technologies for electrified and autonomous vehicles as well as transportation services. The average annual spending will be 58 percent more than over the past five years, the company said Wednesday in a statement. After a decade-long boom, the world's fifth-biggest carmaker and competitors are facing cooling demand in China, Europe and the U.S. That challenge is exacerbated by technology shifts such as the rising popularity of ride-hailing services that are making vehicle ownership less necessary. 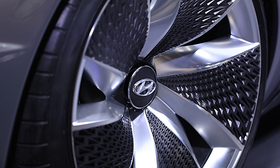 Hyundai said it wants to lead "the paradigm change facing the automotive industry." The company also said it will achieve an operating profit margin of 7 percent by 2022. Hyundai Motor's profitability has been less than that in each of the past four years, according to data compiled by Bloomberg.